and the pokers get poked. and the smokers get smoked. right down to the core." The last day of April and I still have some poetry books to share with you. I will try to post about each of them before moving on to something else.Let's start with this full-o-fun collection. 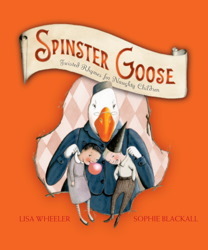 Did you know there are children out there who would give Mother Goose a run for her money? Well, I hope you don't necessarily know them personally. However, you may recognize them among these witty verses and you will be glad to know that Mother Goose's sister has a better track record for handling such brats! The grounds are a nightmare. Aren't kids going to love listening? I am off to a grade three class this week to share my poetry journals and some new poetry and you can bet this one will be at the top of the pile. I cannot wait to see and hear their reactions. With tongue in cheek and a propensity for wonderful word choice, Lisa Wheeler creates poetry that will be enjoyed over numerous readings. Listeners will want to compare these ones with familiar poems from their own repertoire, will be dancing in their seats, and will want time to look very closely at the watercolor and ink illustrations of Sophie Blackall. She picks up on the tone of the poems and adds just the right humorous touch to make the wicked creatures live on each pages. You are in for a fun time when you share this book! "Father Murphy would be donning his vestments and preparing the sacraments. Oops! There he was now, entering. She darted under the edge of the draperies and hid. She could see, peeking under the edge of the thick velvet (which was slightly frayed - she should nibble those borders and clean up that edge a bit), his black shoes on the dark blue carpet." I love that two of my favorite authors have written books about mice this year. 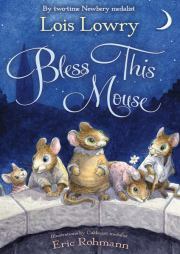 First, Cynthia Voigt with Young Fredle (Knopf, 2011) and now Lois Lowry with this lovely story of a group of church mice, led and loved by Hildegarde. She is the ultimate caregiver; she looks out for each of her charges, offers advice, plans and arranges for care and safety. The Feast of St. Francis is upon them. There are serious concerns with the visits of so many pets, especially CATS. In case the blessing must be moved inside due to weather, she wants her charges to find safety well and away from any visitors. There is another issue; if parishioners happen to set eyes upon any mice, the Great X will be called again. ""Exodus! Pass it on!" Vivian squeaked to her adolescent children, and shooed them off to be messengers. "Exodus! Pass it on!" Jeremiah called through a furnace duct. In seven different locations, other mice heard it and repeated it so that news went from mouse to mouse to mouse until each one, all but the smallest ones, knew, and knew what it meant. They all prepared to flee. They were going Outdoors." When the feast of St. Francis moves inside because of inclement weather, she is equally prepared. She cautions her charges to be vigilant and careful, and to seek refuge in the safest and hardest to reach places in the church. I love Hildegarde. She has everyone's well-being at the center of her soul, and provides leadership and a calm and assured guidance. While the author gives us the words that bring this lively household to life, Eric Rohmann does the same with his charming, detailed illustrations. They are a great team! Lois Lowry offers her readers a quiet, warm look at Hildegarde's extended family without ever feeling intrusive. I came away from the reading feeling as I did when I read other such wonderful tales as Charlotte's Web, The Tale of Despereaux, The Miraculous Journey of Edward Tulane and even Redwall. Thank you for a new classic read for our children, Ms. Lowry. "There was little weight, going. There was only heat, the sun already baking the air, even though it was long before noon. It would take her half the morning if she didn't stop on the way. Salva's life changes in a heartbeat. One day, while a school, gunfire is heard and their teacher sends them running into the bush. He tells them not to go home as the rebels will be going into the villages. Terrified, Salva does what he is told. As he runs, following others, he wonders about his family and how he will find them. Their journey will take these refugees through Sudan, into Ethiopia and on to Kenya. In the mass of people, Salva finally recognizes his uncle and travels with him. They are searching only for safety. As they travel Salva is witness to disease, hunger, gunfire and even death. It is a miserable trek; but somehow Salva finds the strength and courage to forge ahead. He lives in fear for himself and for the family he has left behind him. As we read about Salva during the Civil War in the 1980s, we also meet another child. Her name is Nya and her daily task is to walk to the pond for water. That walk, to and fro, takes eight hours. It is all she does. There is no school, there is no time for play. The water that she brings home from the pond is dirty, carries disease to her small sister and is what keeps her family alive. She lives in today's southern Sudan. Salva's time of travel and his life in the refugee camps is heartbreaking and full of pain and terror. When he is sponsored to make the trip to Rochester, NY, he goes with a resolve that has been made stronger by those experiences. Ultimately, he makes the decision to help bring change to the people of his country. "In a few more days, the school would be finished. Nya and Dep and Akeer would all go to school, along with the other children. Next year there would be a marketplace where the villagers could sell and buy vegetables and chickens and other goods. There was even talk of a clinic someday - a medical clinic, so they wouldn't have to walk so far to get help, as they had to when Akeer was ill. It was the well that was bringing all these good things." There is much here for us to learn about the world beyond ourselves. 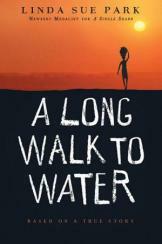 It will give readers a powerful look at and a better understanding of the people of Sudan. It introduces a young man whose tragic life circumstances did not defeat him, but made him stronger. It gives us a modern hero to honor and appreciate for his life's work in bringing water to his people...one village at a time. Well done, Salva! calls a rat to feed. Rat gets a hug today." National Poetry Month is coming to an end and I'm going to miss it! It's been such fun reading blogs, posted poems, and new books of poetry all in celebration. I won't stop reading poetry and telling you about it, but it has been fun to focus on it over the past month. Not only is What's For Dinner a most enjoyable and welcome addition to the plethora of new poetry being published, it is equally good as a work of nonfiction. So much has already been said about this book and all of it well-deserved. Katherine Hauth must be delighted with its reception. Publishers Weekly called it "an enriching overview of the natural world spiced with a Dorothy Parker–esque sense of the macabre that children will absolutely relish.” I could not agree more! There is much to be learned here. Katherine Hauth has done her research. David Clark adds depth and hilarity in his ink and watercolor artwork. Kids will come away more knowledgeable (as I am), having had a good laugh and wishing there were more of the same. "Roadrunners eat almost everything: insects, fruit, small animals, and eggs. During spring courtship, the male often wins his mate by offering her a lizard. Because roadrunners are so fast and their beaks so sharp, they can kill rattlesnakes! Then they slowly swallow them headfirst." Huh? I can't wait to share each one of them, and listen to the 'eeewws!' Oh, and the laughter! "Today Miss Currier gave each of us a 100th Day project. Annabelle is going to write one hundred poems about animals. Noah will learn one hundred facts about outer space. Kyle will keep a weather log. I have to read one hundred books. This is going to be a disaster." There are a few things that Graham doesn't like...school, reading, and now he's not too keen on the 100th Day celebrations. What he does love is the classroom birthday party. Guess what? His birthday is on the same day as the 100th Day party. "Jack's new puppy came to school today for his birthday. Miss Currier passed out cookies shaped like doggy biscuits. She sure knows how to make parties fun. Too bad I'll miss out on mine." "For my self-portrait, I used forty pink sequins, twenty-six pasta shapes, two blue buttons, eleven split peas, twelve fuzzy balls, and nine pieces of straw." You know what kids are going to do, right? Do 42 + 26 + 2 + 11 + 12 + 9 = 100? The best part of it all is that they can look to the multimedia artwork on the facing page and check it out, if their mental math fails them. And you can bet they will be making sure that the artist has used exactly what is described. What fun is that? 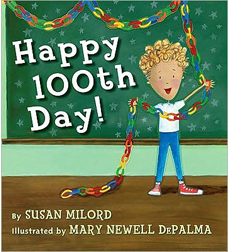 And oh, the artwork...such encouragement for readers to practice counting to 100! There are 17 w(well actually 18) opportunities for them to do just that. A list on the back endpapers remind them to make sure that they have checked them all. And don't forget to find all the numbers from 1-100 on the endpapers themselves. Now, that's a math blast! "If there's a pile of dirt or rock to be moved, then a bulldozer is just the machine to do it. With a powerful engine, caterpillar tracks, and a big metal place, called a blade, at the front for pushing, a bulldozer is designed for earth moving." Joey's coming to get new books tonight and I know that this one will be on the top of the pile. It's a pop-up book and who doesn't love them? It's got working pieces, lift the flaps, and pockets that contain tools and materials to get these amazing machines to work. I am astounded by publishers who are willing to go the extra mile to make sure that books such as this are available for young children with a keen interest in their subject. Robert Crowther is masterful at the art of paper engineering. One of Bret's first baby gifts was The Most Amazing Hide-and-Seek Alphabet Book (Viking Kestrel, 1978) and we could not fathom the talent of such an artist. We still have the book, which is testament to the delight taken in sharing it and the knowledge that 'paper is paper and we must be careful with it'. This invitation to visit a construction site and actually see how each of the big machines performs is almost TOO much. The anticipation is palpable and the awe with which young readers will look at each of its pages will bring delight to those who share it. Being able to actually see how these monsters function and what their purpose is during their workday lives adds knowledge that will be retained because of the active participation. 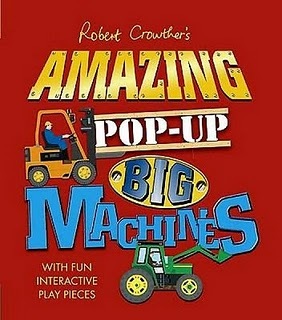 Each of the machines -bulldozer, tractor, forklift, dump truck, and crane- comes with a 'fact file' that offers up even more information, and accompanies a flip file on the left hand side of the double page spreads that add concise descriptions of other road building, farm, factory, quarry and building machines. This is not a book for the library, but for careful hands and personal perusal. It is sturdy and will afford hours of fun for interested machine aficionados. Up, up on our tippy toes. Can't wait to choose new shoes. I'm always on the lookout for books that my 'shoe-loving' Erin might appreciate. In this one, four little girls - Ashley, Claire, Emily, Kaitlyn - are off to find shoes to match the awesome attire they plan on wearing to an upcoming shindig. If you look closely, you will see that their favorite and most exclusive shoe shop is found at the corner of Hightop and Oxford. What a place to put a shoe store, huh?? Or do you think that might be a little added wordplay by the most accomplished and creative LeUyen Pham? Each of these young misses wants the perfect pair of shoes. Is it genetic? Do most women try on pair after pair after pair? It seems so with these friends. As variety is offered, and rejected, the pile grows and the experienced and attentive shoe salesman becomes even more exasperated. There appears to be nothing these girls aren't willing to try; he is adept at finding what might attract their attention. They try stripes, polka dots, leopard spots...alas, closing time is upon them and they cannot make up their minds. The mountain is left for the salesman to return to the shelves, the girls head for home and a more concerted effort to find the right shoe...or create it! These ones are just right! 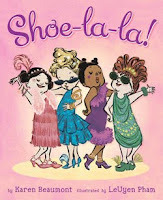 The rhythm and rhyme of the words, the glitter, the humor and the array of shoes that they might choose will have young fans poring over the pages. It's a great readaloud for those in love with dress-up and big girl shopping. The quick pace of the text, the bold color used and the unique personalities of the young ladies portrayed add to the fun for toddlers on up. It was great fun to look closely for the shoes that I might choose. "Small Saul was hardly a natural pirate. Being rough and tough just wasn't in his nature. He was good at Intro to Swabbing the Deck, but he was easily distracted during Treasure Map Interpretation." Poor Saul! All he wants is a life at sea and the stars seem to be aligned against him. He's too small to be a sailor. However, upon searching out other options, he finds that he is eligible to enroll in Pirate College. He's not what you would call 'cut out to be a pirate'. He does have skills with music and maps, and he's very good at keeping the decks spotless. Looting and hurting people is not on his 'bucket list'. With grim determination and a lot of thought and study, Saul passes the competency tests for would-be pirates and he's on his way. 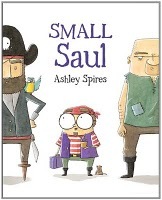 "Small Saul may not have been your average pirate, but he had tried his best. He had made their ship a home. Just like treasure, Small Saul was rare." Once they have him back on board, Small Saul forgives them for 'doing what comes naturally' to a pirate and a sense of calm settles over the ship. "The artwork in this book was rendered in ink, watercolor, water, flour, a cup of sugar, a dash of vanilla and baked at 350 degrees". I say unequivocally that she has also added pinches, smidgens and dashes of humor, humility, wonder and great storytelling. This tale will be appreciated by anyone who has dared to dream, or has been the brunt of another's criticism; it will prove to each of them that honoring differences can make all the difference. Bravo! "As the door closed on Dad, Lily opened her mouth to give a big yell. But at that moment a little dog ran into the hall. He was white with pale brown ears and patches. He ran straight up to Lily and licked her hand. Lily liked that. She decided not to yell for the moment after all." Poor Mom! She's is bed with the flu. Poor Dad! He's charged with finding somewhere for Lily to be while he is at work and Mom is at rest. Poor Lily! She has no interest whatsoever in going to the neighbor Melanie's house for the day. It's a catastrophe in the making! While Lily is adamant that she doesn't want to go, Dad keeps his cool. Showing great enthusiasm for Lily's upcoming adventure, he hustles her into her stroller and they head off to meet Melanie again. Once Dad has gone, Lily remains apprehensive and chooses to be alone with her stuffed puppy. Melanie is patient and goes about her day, feeding her baby Sam and then letting him play on the floor near Lily. Sam is an entertainer and soon Lily is laughing. It seems he quite likes her, and she feels the same. Nap time leaves Lily and Melanie looking for a project to keep them occupied and Lily soon joins in the bookmaking. Very quickly, Sam is up from his nap and it's time to walk to school to meet Melanie's other son, Jack. The children play, then watch television companionably. When the doorbell rings announcing Dad's return from work, you can imagine Lily's reaction! We've all been there. A perfect scenario for her target audience, Shirley Hughes shows she has not lost her understanding for a toddler's insecurity and resistance to change. She once again paints a memorable character with an attitude that holds up in this most common situation. The lips are pouty, the demeanour uncertain, and the willingness to make the best of it believable. The ending - predictable and endearing. "But here's somethin' you maybe ain't yet learned of: Mark Twain warn't even his real name. His real name was Samuel Clemens. And it's Sam I mean to fix on. Not to worry, though. This ain't intendin' to be some windy bioografy. I don't lean to writin', and I don't fetch to books much either, 'specially long ones. But here goes." Last year Mark Twain's daughter gave us an up-close and personal look at the father she loved (The Extraordinary Mark Twain (According to Susy), by Barbara Kerley). There we learned much about the father, the humorist, the writer and the family man. Now, Huck Finn thinks it's about time he had a say in telling what he knows and thinks of his literary father. As you can see from the front cover, the illustrator has covered most of the important 'stuff' for the audience. There's Huck adrift on a raft (well, book with Sam's portrait prominently displayed) in the Mississippi, using a pen to propel him safely downriver. He's got his slingshot and his sense of humor and he regales us with tales of Mark Twain (really Sam Clemens) and his life. "Sam built him and Livy a house out East, in the state of Connecticut, near as big as a steamboat. There was tons a' rooms, a slew of baths, a marble floor, and an outside part all wedding-caked with turrets, spires and balconies." "Some folks didn't take to Sam's writin' the way real people (like me) talks. But Sam didn't care. He writ it like he heard it. And pretty soon, he warn't just famous. He was rich." "Still, bein' a character in a book ain't all peaches an' cream. 'Cause a character's got to go through the same stuff again and again and again. Til he's near bored to death!" An editor's note includes a timeline of Sam Clemens' life, giving dates which Mr. Finn did not provide. "Dogs have hair. Cats, fur. Dogs whine, yip, howl. Cats purr. Wait - let me back in!" It wasn't long ago I suggested to teachers, especially at the intermediate level, that haiku is not always 'easy' when trying a new poetic form. Traditional English haiku is quite specific in its elements. It has seventeen syllables, a three line form (5,7,5 syllables in the line), describes a moment in time, is often about nature and a season, and should be able to be read in one breath. Then along come authors Bob Raczka (Guyku, 2010), Michael Rosen (The Cuckoo's Haiku, 2009), Jane Yolen (Least Things, 2003), Jack Prelutsky (If Not for the Cat, 2004), Paul Janeczko (Wing Nuts, 2006) and Andrew Clements (Dogku, 2007) who offer up contemparary poems to help us all see that 'we can do it'. Ours may not be as polished and pleasing as what these talented people have written; but they each help us believe in ourselves as poets, and that's what I want for young writers! In an author's note Lee Wardlaw describes the difference between haiku and senryu, which developed from and are similar to haiku. Then she tells her audience that her story is told in a series of senryu: "the foibles of human nature - or in this case, cat nature - are the focus, expressed by a narrator in a humorous, playful or ironic way." She hits her mark with Won Ton. 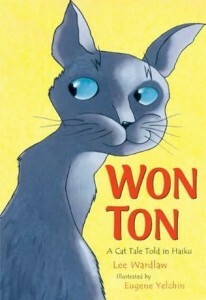 Won Ton, a rescue cat, is the teller and his voice is clear, and often haughty. The chapters are short and refer to the events in the tale...The Shelter, The Choosing, The Car Ride, The Naming, The New Place...you get the picture. "No rush. I've got plans. wish: Please, Boy, pick me." This tale is told by someone who absolutely understands a cat's psyche. Her poetry is matched by an artist whose ever-changing perspectives, expressions and backgrounds allow readers a light-hearted look a captivating canine who's looking for love in all the right places. bake it with a nap." "I grabbed that rope and started to climb. And climb, and climb. When I got scared, I didn't look down, I just kept climbing. Even when I got tired, I kept going. But then I got to that part of the rope where I usually jump off. For a minute there, I didn't know if I could keep going. But then I said to myself, "Come on, Good Luck. Take it to the top."" 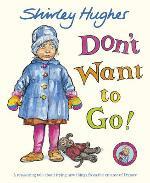 Here's another book for those youngsters eagerly awaiting new early chapter books. It's not too long, has large typeface and is filled with engaging characters who relate to each other in unexceptional ways...just like in real life. Clara Lee is in third grade and deals with many of the same issues that all eight-year-olds face...family, friends, school, rivalry, dreams and worries. Her grandfather is Korean and an interpreter of those dreams. When Clara Lee has a bad one, he is reassuring. He tells her that death in a dream brings good luck, and that luck is hers! That is all she needs to hear. All day everything seems to be falling into its proper place, and it is all due to her GOOD LUCK! Up until her luck changes, Clara Lee has dreamed of entering the competition to be Little Miss Apple Pie but has been too uncertain to try for it. She is, after all, a Korean American....maybe that is not enough when in competition with a 'true' American opponent. With good luck at hand, she decides that now is the time and she enters the contest. Clara Lee is not a perfect character; but she has good friends, a wonderful caring grandfather, an occasionally annoying little sister and a slightly frustrating relationship with her parents. Haven't we all been there? And it will be so for many of the children who choose to read this spirited story. While life is not always as she might want it to be, Clara Lee faces each scenario with grit and ingenuity. What do you think? Might there be a sequel in the works? I'd keep an eye out for it! "There's an easy way to do a search and a hard way. The easy way is early in the evening with a cool breeze and a steady partner. The hard way is high noon with a crazy chicken clucking in your ear and two feather balls riding your tail. This search was gonna go the hard way." Oh boy, here's a great Easter gift for a six-year-old who loves to read! Easter - chicks...you know! J.J. has retired from his adventure-filled life as a rescue and training dog. Now, he spends his days in relative obscurity on a farm with chickens, no less. One of them comes looking for him when two of her chicks disappear. She can't promise compensation, except in the form of a cheeseburger. So, J.J. takes the case! A ransom note is found and all clues lead to the house where J.J.'s foe, Vince the 'Funnel', lives. Vince is a dog that never leaves the house, hates the new dog and appears to have an accomplice in the abduction. There are no humans present, and the whole show belongs to dogs and chickens. There is so much to love about this funny tale. One of the chicks has a fondness for books, and will go to any lengths to ensure time to read. J.J. is willing to share much about his time in search and rescue. Kids who read, or listen to, this charming detective story will be pumped to know it is just the beginning of a brand new series. The sarcastic humor of the dog at the center of its action had me laughing out loud and waiting for the next barb. The chicks and their mother hold their own in a series of funny incidents, and poor Vince falls victim to their combined plotting. Kevin Cornell matches the wit and humor of the story with his appealing, expressive characters. There is much to see here, and kids will enjoy every twist as they play out on its pages. What a way to get young readers hooked on mysteries! I can't wait to see the next one. "Normal times I sleep on my pallet, a mattress filled with straw and corn husks in the loft of the storeroom near Abbey or close by the fire in the kitchen. I am first to rise to start the fire so it is hot for her. I sweep the ash to the side to get ready to bake the morning bread. I fetch water and firewood for cooking. I scrub pots. I peel potatoes and tend the kitchen garden - whatever Abbey needs. Times are not normal now." 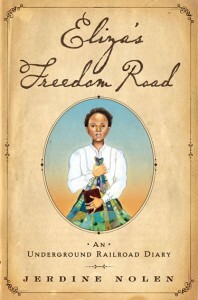 There are not many Underground Railroad stories that were written specifically for a younger audience...this diary would be a 'just right' introduction for them. It is Eliza's story. She is twelve years old and on her own in her master's house. No father. Her mother was recently sold, and Eliza does not know if she will ever see her again. Her most prized possession is a quilt that her mother made for her. In its patches are representations of the stories that Mama shared with her daughter; two of the twelve are left open for those stories that will belong to Eliza. It gives Eliza solace when she is full of grief over the loss of her mother's gentle, loving presence. Eliza's life is uncertain. She has been taught to read and write by her ailing mistress. It keeps Eliza safe for the most part; but she is never totally relaxed, knowing that her master might sell her at any moment. When she accompanies her mistress on a visit to Maryland, she is able to let down her guard. While there and watching her mistress become steadily worse, Eliza learns that there is a chance for escape. With guidance from an old friend she sets out alone on the arduous journey to freedom. With the help of Harriet Tubman and other good people she is able to make the trek north, where a surprise awaits. Interspersed throughout the text are the beloved stories that were told to Eliza by her mother. Eliza writes them in her journal so that she will never forget them. Eliza has inherited her mother's storytelling gift, and is always willing to entertain. Children will come away from the reading of her diary with a better understanding of the workings of the Underground Railroad, hopefully allowing them to give up a misguided interpretation of a railway that travels under the ground to safety. Eliza is a strong character, whose bravery and will carry her through difficult days on her journey north to freedom in Canada. Backmatter includes an Author’s Note, Notes on the Stories, a Bibliography, and a long and detailed list of useful websites. 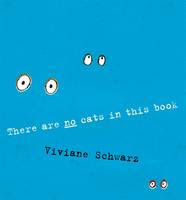 Look closely at the cover and you'll know exactly how the two characters in this reassuring picture book are feeling. The little one wears a apprehensive and concerned look (even his cat seems unsure), and the mom is quietly reasurring with a warm smile and a firm holding of hands. The news of the baby's arrival is shared and the questions flow. "What will we call the baby? or Josephine or perhaps Jennifer. should be called Peter or Spider-Man. What will the baby do?" 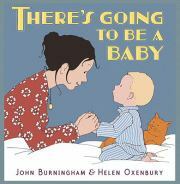 As they discuss the many occupations a baby might try, the soon-to-be-sibling has a quick and reflective response. The artwork on the following two page spread shows, in a series of panels, the mischief that could ensue should the baby take each particular path. tell the baby to go away? This very talented and caring team are mindful of the insecurities felt when a new baby's arrival is imminent. They use their plentiful skills to show their young audience that they are not alone if they harbor worries about the same thing. In the end, all he really needs to know is that a parent's love for him will not change with an addition to the family. Mission accomplished! another up and down trees." I think it's a wonderful thing that we have accomplished authors writing picture book biographies for some of our younger readers. It is often a book just like this one that will lead a child to look for further information about a person they have come to admire. Patrick McDonnell uses expert design, dense paper and subtle color to bring his story of Jane Goodall to his young audience. It has an old fashioned feel, with stamped images in the backgrounds adding interest. His uncluttered artwork, which transports us back to earlier times, fully matches the simple, informative text about the young and fascinated girl who would become the woman known internationally for her lifelong work with chimpanzees. 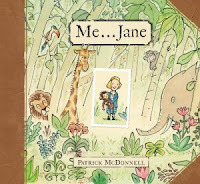 He creates a world of wonder for the young Jane and attends to this early part of her life, while also showing us what will lead her to her life's work. Jane and her stuffed chimp Jubilee spend hours of discovery, trying to answer the questions that her inquisitive mind formulates. Upon reading the book a second time, I felt Jane's presence more acutely. The fact that the author has included childhood drawings and journal entries as well as archival photographs from her youth and the present offers an awareness for the children reading it that she is a real person. I love the way he brings his story to a touching conclusion. Additional information, as well as a note from Jane herself, will add to the store of knowledge collected and offers a suggestion for readers to become more involved in and aware of the environmental needs of their world. I have been invited to present an upcoming workshop for teachers with an emphasis on literature for sustainable development. You can be sure that I will include this great book! It's tough to share such a simple book without telling you the whole story. Kids will love it and it will fire their imagination to consider other options for its direction. The opening lines (shown above) set readers off on an adventure with thought-provoking text and entertaining artwork. Jim Averback knows how to hold a young reader's attention by giving just enough time to explore a new idea before the page is turned. It reminds me of Laura Vaccaro Singer's wonderful What If (Roaring Brook, 2010). Simple, but such an opportunity for talk and critical thinking for readers and listeners. There are surprises that might upend their predictions. I expect that will only add to the fun. He keeps up the pretense until this circular story comes to a satisfying end. It gives kids pause about jumping to conclusions, and that is an important little lesson for each one of us. Heartwarming and engaging. 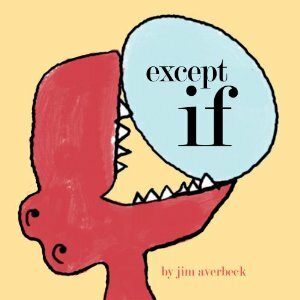 Can we ask for more in books that we share with our favorite up and coming readers? "I mean, imagine it. Your mother is inviting the whole community to your backyard to eat hot dogs and sing folk songs. Bring your beat-up guitars, your whining fiddles, your world-weary mandolins, your honkin' harmonicas! Bring your overalls, your bandanna-wearing dogs, your hayseeds, your green-life Porta-Potties! Bring your homemade bread and lentil stew and wheat germ brownies!" Is that like every teenage nightmare? If you are trying to be 'normal' and Janie definitely is, the last thing you want is to draw attention to yourself through your mother's blog about farm living and an open invitation to a hootenanny. A fourth-grade field trip to the farm and her enthusiasm for its benefits gave Janie's parents the needed impetus to rethink their dream of farm living. For five years and up even up until mere months ago, it had worked for the family. Now that Janie is in high school, things are drastically altered for her. It makes her a target for snide remarks, and takes a concerted effort on her part to live under the radar of her high school classmates. As anyone who has tried for it knows, 'normal' is elusive. And really, why be normal? There are so many more interesting choices to make. It is what Janie discovers, as she just begins to live her life as it happens. And she makes an interesting discovery along the way...people like her! The characters resonate with voice and personality. Even Loretta Lynn, Janie's favorite goat, offers support. "I sigh. "Do I have a choice? "And much to my surprise, it's my dad who says, "No, you don't." "Mike?" My mom looks at my dad, who's standing in the kitchen doorway. We all do. My dad is a champion of staying out of things, which includes keeping his opinions on mother-daughter conflicts to himself. "I think it's time Janie rejoined the family," my dad says. "I'm tired of her acting like we're not good enough for her anymore." I feel like I've been slapped. "I don't think I'm too good for you," I stammer out after a minute. "I just - I -""
If you ever had or lived with (or as) a fourteen year old, you have had that conversation or some facsimile of it. Frances O'Roark Dowell might have been living in my house when I was that age, or more likely when my kids were that age...or she's close enough to their age to still remember such conversations vividly. The scenes are poignant, humorous, embarrassing, and even uplifting. She makes 'normal' seem impossible and offers a reminder that we are 'all' some miles past it. Her characters are to love and to remember fondly...Sarah, Emma, Monster, Septima Brown, Hazel and Harlan Pritchard, sister Avery and the 'rents. In one review I read of this special book, the reviewer said, "Janie was going for normal, but she missed her mark by about ten miles…and we mean that as a compliment." I wholeheartedly agree! at the poodle next door. When parents divorce, children often end up spending time in two households. There are clothes, toys, books and rooms in each of those houses. But, what happens to any pets that might be a part of the child's life? 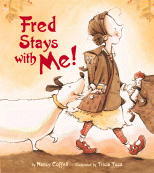 For the little girl in this lively and heartfelt story, Fred is the one thing that stays the same as she moves from house to house. Fred is her constant companion, always staying where she is staying. It seems to work for everyone. But Fred is also dealing with divorce and he has some issues. The neighbor's poodle barks at Fred all the time. Fred has eaten all his socks. "Fred can't stay with me!" says my mom. "Fred can't stay with me!" says my dad. "Fred doesn't stay with either of you. The mess requires a solution and everyone works together to find it. The text is simply stated. The storytelling is glorious. Here is a family that is doing its best in an unhappy situation....they are making it as good as it can be, for the sake of their child. Tricia Tusa uses sepia tones for her wonderfully detailed and honest artwork. She shows how strong the emotional link between the girl and her beloved pet truly is, while making both whimsical and lovable. Oh, I LOVED The Quiet Book (Houghton, 2010) and I eagerly anticipated its companion. This time the noise is LOUD and I have to tell you I LOVE this book, too! Kids will love it, as will the adults who share it with them.Think of the possibilities, once imaginations are given free rein to keep the fun going. It doesn't take them long to discover that some sounds they would describe as quiet can be quite loud, given the right context. What about 'deafening silence loud'? Wait until you see the accompanying illustration. Perfect! Have you been bothered by 'candy wrapper loud' while you are trying to listen to a concert or 'popcorn eating loud' when you are at the movie? Do you see where she's going with it? The noise of unwrapping a candy wouldn't bother anyone on a schoolyard or at the park. But, you've been there when someone is trying oh, so carefully to open a cough mint in the midst of a theatrical performance...LOUD! 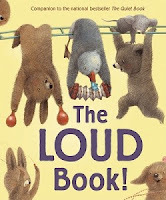 It's fun, it's thought-provoking, it's discussion prompting and it will allow little ones to try out their 'loud' in the same way they tried out their 'quiet' the first time around. What more can we ask? Now, get checking it out for loud sounds of your own...in the house, in the springtime backyard, on the street, at the mall....you get it! It's for everyone. Get out there and explore your world! The careful and delightful pairing of language and art is outstanding. These collaborators are to be much admired for their talents and their ability to create tiny perfect gems that will always have a place on my 'keeper' shelf. Did you think she could do it? Well, she proves most decisively that she can and did! The LOUD book is as much fun as The Quiet Book; and maybe even more so, since I am pretty loud myself! this vulture takes a sunbath. In this new series, Steve Jenkins and Robin Page bring superb nonfiction to our youngest readers. The text is short and sweet, offering up a look at many animals of the world and how they manage to keep themselves clean. The methods are as varied as the animals who take them. The collages made from torn and cut papers are boldly colored, delightfully detailed and expressive. The tiger gazes directly at readers as he soaks in the river water that is his bathtub, while the macaques delve deeply into the hot springs that offer comfort and calm in the midst of the brutal winter. "Some ants keep clean by scrubbing each other with feet that have been dipped in the ants' oily saliva." Reminds me of the 'spit washes' we got as kids when company came to the door, or an ice cream cone dripped down our chins. EEEEWWW! So much to see and learn. As I have come to expect, Robin and Steve have done their research too well. They have more than enough information to share with their readers; and so, they add short descriptive paragraphs further detailing the chosen creatures following the initial text. In a box that arrived from Thomas Allen today, there is a second book from this series...time to SLEEP. "The walrus isn't choosy about where it beds down. It naps on the sea floor, sleeps as it drifts along on the ocean's surface, or snoozes on the beach. Sometimes it just hangs out, supported by an ice floe and its long tusks." On those nights when sleep doesn't come easily, I wouldn't mind being a walrus. How about you? That's two...now be on the lookout for time to EAT. "Why had so many people gathered to watch a barrel plunge over the waterfall? Wouldn't the tons of water pounding onto the rocks below have simply broken it to pieces? And yet there they stood, watching and waiting, holding their breath - waiting, because they all knew the barrel was not empty." "This was not the case. There is something decidedly fantastic and not quite real about Niagara Falls, about Annie's adventure, and about the stories that can unfold when imagination, determination, and foolhardiness combine to set humans off in pursuit of their goals." Being a sixty-two year old woman, I can tell you that thinking about having myself fastened inside a barrel with a handhold and a bunch of soft pillows would ensure an untimely death, never mind anyone putting me in it, then in the water and sending me over Niagara Falls. I almost couldn't read the description without feeling woozy. Daredevil I am NOT! We know much about the Falls and the fact that the water 'drops from a height that is as tall as a seventeen-story building'. What would entice a former charm school owner and teacher to even consider going over them? Annie was in need of money following the failure of her school. She thought about the kind of work a woman might do in the early twentieth century. Perhaps clerk in a store, or clean homes, or any number of other menial tasks...none would provide a viable living for a woman on her own and facing old age. Notoriety might work! What could drum up more interest, and money, than riding over Niagara Falls in a barrel? Now, I know that sixty-two year old women can be determined, feisty and steadfast in their commitment to a goal, so it isn't surprising that Annie set about doing all that she needed to ensure this adventure. She would live to tell people all about it, and they would pay money to hear her tell her story. It didn't happen...people were not interested. They were, however, quite taken with the barrel...and it was stolen twice from her. She had to have another one built for her. She sold postcards and souvenirs at the Falls for years, while the replica of the barrel formed the backdrop. She also had accomplished something that no one else had ever done...and she was content with that! 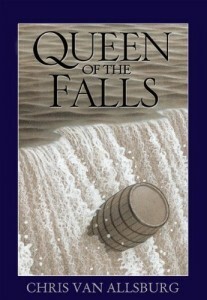 She is, to this day, the only woman to have gone alone over the Falls in a barrel. As with his other books, Chris Van Allsburg creates impressive illustrations to accompany this tender, and sad, tale of a woman with a dream. He tells her story with honesty and compassion, showing each of the many scenes with clarity and a sense of wonder at the feat she accomplished. We come away from the reading feeling that we know Annie, and awed by the tension he creates to help us take the ride with her. For the first time I wonder what else has happened in 'this' world that might attract the attention of such an acclaimed and honored artist and storyteller. Personally, I can't wait (as always) to see his next book! by climbing in my bed. I'll sleep on it instead. and finding cats to chase?" Please tell me that every time a baby is born in your family or within your circle of friends, the first thing you think to buy is a book! It is a present to be opened again and again....and may be the one that the grown child never wants to give up. Now, there's a lifelong gift! To that end I am always delighted to see a new collection, especially for little ones. This one is a companion to Here's A Little Poem (Candlewick, 2007) by the same authors. I have given it as a gift numerous times and now I can double the parents' pleasure. There's one for the daytime and now one for bedtime. This lovely book is the same size...big and full of sixty poems meant to be shared at night, but sure to please at any time of day! Why can't I go to bed dirty? What's so special about being clean? I am dirty today. I'll get dirty again. So why bother to wash in between? They are arranged in three groupings, each having importance in the bedtime rituals of many families. The first is Going to Bed, followed by Sweet Dreams and finally, In The Night. Anyone who has raised children will remember there are, indeed, distinct differences from one to the next. There is so much here to read, enjoy and read again. It could be the 'just right' bedtime book for a long period of time. What more can we ask...time at the end of the day to delight in words, to sit cosily sharing those delightful words and to wind down from the many daily routines of living. Ah, sweet peaceful place! I've hummed myself to sleep. G. Brian Karas' rich deep colors, mixed media textures and shadowy infused light add just the right touch and offer a setting that is sure to encourage quiet talk and relaxation. An index of first lines and of the poets themselves is most helpful. ""A Sea Lion?" Dad asked. "A Sandy Lion," Gregory said. "Sandy needs a tail," said Dad. and don't leave Sandy," Dad said. A lion in the sand is the perfect way for Gregory to express himself. As he draws the tail, it gets longer and longer. When he realizes that he can no longer see his father, he knows he is lost. But, the tail comes to rescue and leads him safely back to the blue umbrella and Dad. 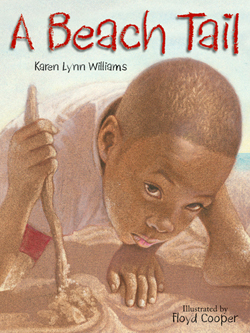 What fun for all children...a day of wonder at the beach, in the sand and the sun, following your heart along the sandy shore. The rhythm of the text carries Gregory along, past the purple jellyfish past an old abandoned sand castle, close to a horseshoe crab and through a giant hole. There is wonder wherever he looks. No adults, just Gregory and the adventure of sand exploration and freedom. He even leaves his signature for all to see. There is a niggling worry when he turns back around and realizes how far he has come. But, his sandy stick trail and all of the recognizable landmarks uncomplicate the return trip. Soon he is right where he belongs, alongside his father and under the blue umbrella. 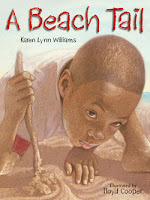 The palette chosen by Floyd Cooper for creating his pastel art puts his readers on that sunny, warm beach alongside Gregory, an aspiring artist himself. The grainy texture and the sun-washed backgrounds are perfect for helping us conjure up the warm days of summer. He is incredibly adept with the many close-ups of a young boy exploring his surroundings. Endearing and quite lovely! his favorite flavor of ice cream. my beauty and my bewitching ways." Grow it or cut it? Each day the answer's different. Do I really know what I'm doing? Her decision is momentous and heartbreaking. It isn't long until Grady is gone; arrested for possession and jailed. Following that she makes another discovery. 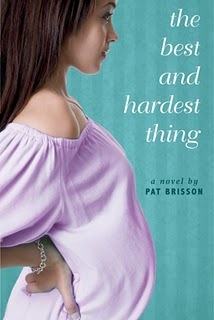 She is pregnant and faced with a decision that is very hard for her to make. An abortion is out of the question, keeping the baby is not reasonable or in its best interests; but giving it up? Can she go through with that decision? 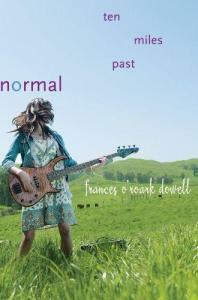 Molly is a character to love and admire, plagued by loss and looking for acceptance at her high school. Her voice is strong and reasonable, while making life altering decisions and facing the repercussions of them.You will hold her in your heart just as she holds her wee son in hers...always! the best and hardest thing I'll ever do. But know my heart will always be with you." Pat Brisson uses eighteen poetic forms to tell Molly's story. On her website patbrisson.com you will find a full description of the poetry chosen and her process for the writing. I love it! "I can't wait to put them on," said Bink. "I love socks," said Bink. I seem to have waited forever to see this enchanting, and captivating book! If it in not in your personal library, you need to put it there. It should be on library shelves EVERYWHERE! It is definitely a "10", a 'keeper', a forever book! Just look at the cover and know you are about to meet two of the most appealing and fascinating characters in childrens' literature! They are that special...and oh, so memorable. I have my toes, fingers and eyes crossed that it won't be long until we meet again. You don't really need me telling you about this book. There are so many reviews online; but, it is a book that I will not stop talking about for months and I am so happy that I can share it with you here. 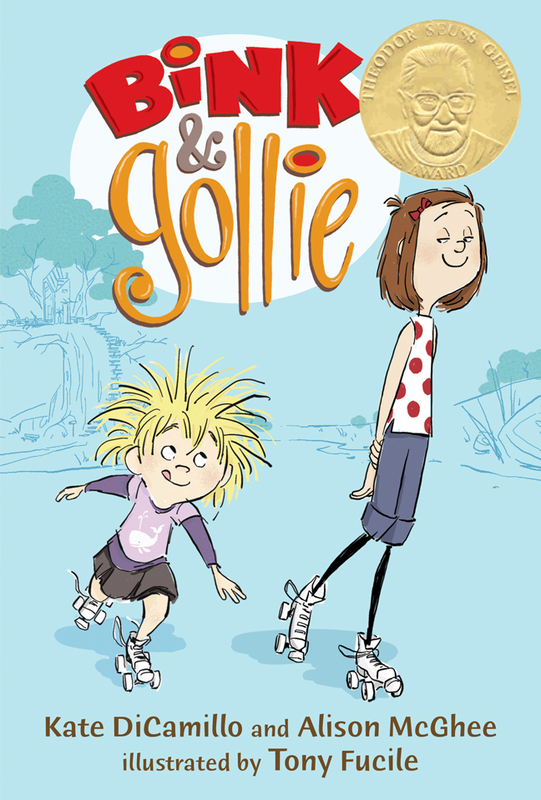 "'The problem with Gollie," said Bink, "is that it's either Gollie's way or the highway." "My socks and I have chosen the highway." "The problem with Bink," said Gollie, "is her unwillingness to compromise."" Because of their love for each other, they are able to make their friendship work and flourish. In three short chapters, we see how that happens. In the first, while out roller-skating, Bink is attracted to a sign at Eccles' Empire of Enchantment offering 'outrageoulsy bright socks!' She is mesmerized by their brightness. Gollie is appalled by it. In the second, Gollie decides she needs a new adventure, and journeys forth. She leaves a note for Bink explaining her inability to answer the door while partaking of the trek. Think Sheldon...Gollie, Gollie, Gollie! Bink knocks incessantly, trying to get Gollie's attention. Gollie is busy and bothered by the constant intrusion. Bink is desolate without company. In the third, Bink wants a pet and a goldfish must suffice...a 'marvelous companion'. Gollie is unconvinced and sees it as 'unremarkable'. When the worst happens, Gollie is there to support her friend in needy times. Marvelous companions indeed! None could be better! And don't even get me started on the brilliance of Tony Fucile's illustrations! His artistic magic touches and enlivens each page, giving us characters who charm at every turn, a setting that sparkles and consistently changing perspectives that offer timely expressions, subtle humor and an unforgettable tale of tolerance, love and everlasting friendship. BRAVO! "Sometimes they worked in the sugar cane. Snook prowled the forest of stalks, and rats squealed with terror at his approach. Sometimes Snook routed a sleeping hare and won a high-speed race with a delicious prize." to his house to go to bed. and every sleeping muscle poised." Abba Jacob is asked to help catalog the plants and animals on nearby islands. Snook happily tags along. His job with the rats and mice is important for keeping the burgeoning population in check there, too. He takes to his task with perseverance and feverish delight. Snook is hard at work when a storm threatens and Abba Jacob cannot get his attention before they are forced to flee to safety. "Snook woke up every morning before dawn. Then he foraged, moused, and drank. The silence was black and empty." His loneliness is palpable in the brilliantly written text, and in the astonishing multimedia artwork. Timothy Basil Ering uses ink and acrylics to create paintings that depict the warmth of the friendship, the fierceness of the storm, the terror of nighttime island visitors, the abject desolation of being alone, and the joy of reunion, while also creating expressive and powerful line drawings to add context and emotion. 'For me, this book is about silence and what we can learn from it. Snook has lived his whole life according to the rhythm of the life of Abba Jacob, and Abba Jacob’s life is work and prayer. So Snook falls into his own rhythm of work and prayer. It’s not prayer in his mind—you know, he’s a dog. But it’s work and silence; it’s work and longing—and longing is another word for prayer. 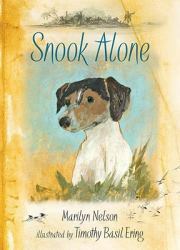 The turning point is when Snook finds in himself compassion—not self-pity, not just longing for his master—but compassion for other living creatures. And that’s what happens in the incident with the sea turtle. Snook achieves a kind of spiritual mastery. And then when he’s reunited with Abba Jacob, he’s a dog with a difference. He’s a dog who has learned something about what silence can teach all of us." that leaped into his arms." No one could say that better! The one on the basketball team? coming up! You should ask him out! Sure! Ask him to the dance or something! I'd want him to ask me." Raina is a typical sixth grader, wanting to be normal and well-liked, inobtrusive yet popular. Coming home from a Girl Scouts outing she trips and falls. The painful result is painful trauma to her two front teeth and the subsequent years of treatment to try and repair the damage done. It is a long, unpleasant and disheartening process that includes braces, surgeries, headgear, false teeth and retainers. That is all about her teeth! What about the normal day-to-day drama of middle school and finding your way through the maze that includes acne, boys, ratty friends and a San Francisco earthquake? How does one deal with all of that, too? As an adult whose passion is art, specifically graphica, you create a story about it. You do it with skill and sensitivity, bringing back memories of your past and trying to make sense of it all for your future. If you are a middle school survivor you might find bits of yourself here. If you had to deal with dentists, orthodontists, periodontists, dental surgeons, you may even share some of Raina's experiences. Every middle school student will be familiar with uncertainty about appearance, vulnerability within friendships and finding independence and a sense of self. 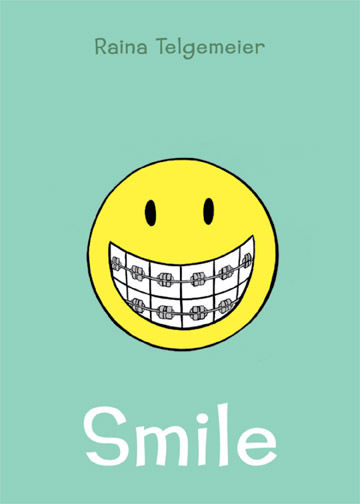 Raina Telgemeier shares this memoir with warmth and dignity, adding generous doses of humor along the way. Your kids will love it, be sure to get it into their hands! must cut some slacks for zem." "You mean, cut them some slack!" I yelled from the sidewalk. "Zat is vat I said!" she yelled back. In this third and final installment of the Blonde trilogy Sophie Kandinsky is sixteen and her world has changed drastically. Her beloved Papa leaves home to find sobriety, her Mama avoids people and talk about her husband's absence by hiding away and crying in her room, her first love Luke is forced to marry his pregnant other girlfriend and the highly annoying David Walter is going to help coach the basketball team to a better-than-last-year season. Sophie does not like the cocky, intrusive David and doesn't mind telling everyone. She sees her place on the team as her only stability in an otherwise pretty unstable world. What about the Blondes and her Aunties, you ask? Well, they are right there holding her up, and helping her to make sense of the many physical and emotional catastrophes that besiege her. They also share their secrets and offer up some humor and much love. What more can a girl ask? "Mama was the muted one in a bright Pepto-Bismol pink "almost Chanel" suit that she saved for closing real estate deals. The Aunties never went anywhere without full armour: hair teased and sprayed, makeup blazing, girdles girdling, and billowing silk outfits meant to dazzle, if not blind, all potential opponents." That is how they 'inconspicuously' attend their first AA meeting, in an attempt to understand Papa's demons and to offer help. "Madison came back from somewhere called the Lake District in England. Kit returned from spending the summer at her mother's place in Berkeley, California. And, although Sarah stayed around, she'd been consumed by the birth of a brand-new baby sister, the fifth blonde, blue-eyed girl in the Davis family collection." They are back to school, to basketball, to parties, to boyfriends and to the many other dramas that are part of their high school social scene. But, they are true to each other and endlessly supportive. The Aunts and the Blondes are absolute proof that having good friends and great relatives is a powerful thing. Oh, and they offer fun along life's path. Funny, sad and unforgettable! If you have not yet met these wonderful people, take a weekend and get to know them well. It will definitely be worth the ride! 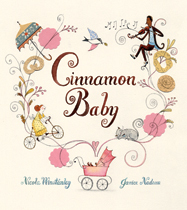 Full of fun, and so much charm, this picture book will have young listeners begging for more. As she did in her first book about Andre, Tiny and Moonpie, Viviane Schwarz offers up an interactive tale that features wondrous pop-ups and collage artwork. We are all thrilled to spend time with these endearing and lovable felines. Their faces are full of wide-eyed wonder, and unmistakable surprise when they notice that we are watching. They quickly want us to know that, while they are happy to see us again, they are on the brink of departure and looking for grand adventure. They long to see all that the world offers! The suitcases are full and ready, but they can't seem to make their way out of the book. They push. They jump. Nothing seems appropriate for the leave-taking. Maybe...a wish will make it happen. They have a fervent request...'please help us'! Readers will love that they have to manipulate the pages as they go along. Add to that the back and forth conversation that the cats encourage, making each one of us a part of their ongoing saga. If this is your first meeting with Andre, Tiny and Moonpie, you want to get right out to the library or a bookstore and see what they were up to in There are cats in this book (Candlewick, 2008). "One cool autumn morning a man named Sebastian was passing Miriam's bakeshop when her sweet-smelling voice came floating through the window. He went inside the shop and bought some cinnamon bread. After that he bought a loaf of bread every day for a year." You know that smell, right? Cinnamon wafting through the air and making a lunge to completely overcome your olfactory senses. Can it soothe a baby's soul? It seems that it might. Sebastian is a cyclist and a musician who is enticed by both. It isn't too long until he asks her to marry him. "The child has big brown eyes and dusky skin and smelled like sweet milk." "As soon as the little bakery began to fill with the cinnamony smell of the dough, the baby stopped crying...and smiled. Then it slipped into a blissful sleep while its mother sang, and her voice and the smell and the warmth from the oven and the taste of sugar in the air filled all the child's senses." The warmth of the colors that Janice Nadeau chooses for her artwork is perfect in every way. The cinnamon toned pages and mixed media images will have readers and listeners wanting to pause for endless moments to take it all in. There are so many wonderful details that you simply don't want to miss! Then try cinnamon bread as a quick fix for your unhappy little one...it might just do the trick. It's bound to make everyone else happier anyway. "From the pool, they parade together through the busy, bustling city. 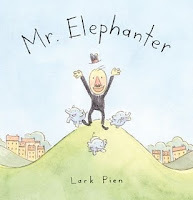 Mr. Elephanter watches for traffic, the shop owners wave, and the elephanties tootle at the cars zooming by." OOOOH, these baby elephanties are so little! No matter...size doesn't mean anything when it comes to caring about others. 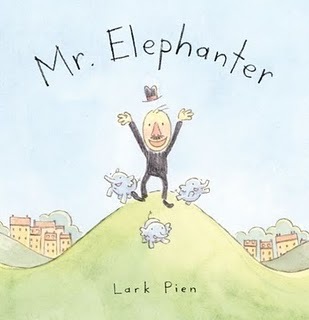 Mr. Elephanter proves that daily, from his early in the morning smile to his quiet hug as he leaves them. Upon arrival, he is greeted by his charges with great glee. Once breakfast is served and eaten, they are off on an adventure-filled day. First, a swim in the neighborhood pool, and then they are off for a walkabout. Everyone is happy to see them. On a scheduled trip to the zoo, they meet an old friend. This grown elephant is one of Mr. Elephanter's 'kids'. Upon listening in on the conversation readers will acknowledge that much care and concern is shared between the two, even years later. Upon their return to the Elephantery the young ones are ready for a nap, and their caregiver is able to catch up on the many small jobs that need doing. (We've all been there!) All is not perfect; what is? Little accidents are tended to, and everyone settles in for some games, a dance or two. As the day comes to an end, serenity ensues. Mr. Elephanter takes his leave with a promise to return tomorrow. Ah, their life is simple and loving, taking us back to a time in the past when life was not so frenzied and frantic. The artwork matches the tone of this lovely story perfectly. There is much to see, and marvel over as you share this book with little ones. Each page is filled with charm and lovely pastel watercolors. Be sure to look carefully at the endpapers as they have another part of the story to tell! I count my blessings every day for the friends in my life....I have 'Lous' there for me whenever I need them! I don't often wake up with a 'rain-cloudy' heart as Noodle did one day. Each one of us has had a similar experience. When we are feeling blue and down in the dumps, we need a friend to help us see things in a different light. Lou is just the ticket! Lou is a strong and faithful blue jay, there for Noodle when needed and offering sage and honest counsel. "With your own special flair."" It takes a while and some perseverance. It's a friendship that is cause for surprise as anyone who spouts the adage about early birds and worms would know. Lou is a friend that we all want to have. Who would we be without them? The rhyming couplets are just right...filled with wondrous words and moving along with precision and perspicacity. I love her work, and kids will love it, too. I wish all those who don't seem suited to a brilliant friendship could take a lesson from these two. Arthur Howard has created an earthworm to love, baseball cap and pride intact when all is said and done. We empathize with his plight, delight in his friendship with Lou and will want to visit with him again. Lou is a loving, bright-eyed, and hardly raucous, jay with an abiding love for his good friend. Bravo! The idea for Noodle & Lou came from a real worm, crawling in the muck under shrubs near our house after a rain storm. Worms are so important, I thought. And then I laughed. Because they are, but they're also just skinny, slimy, silent, beige little creatures. Not a lot going for them at first glance. Once I started writing, I thought, Who better to notice the attributes of a worm than a bird? Odd couples make for good stories because of how their attributes (and quirks) stand out in contrast to each other. So, that's where authors get their ideas! (Or a log with a smile?)" 'menagerie of facts'. There she adds 'stuff' she couldn't put in her poetry. Lucky we are to share such books during National Poetry Month. Get traveling! "In the country of Chad, it is the first day of school. The dry dirt road is filling up with children. Big brothers and big sisters are leading the way." Those big brothers and sisters have experience with the start of a new year in their home country. It is sure to surprise the newcomers. Together they head off down the road toward school, the little ones filled with questions that the older ones are not willing to answer. When they arrive there is a schoolyard but no school. There is no classroom and there are no desks. The teacher is unconcerned. "The last day has come. The students' minds are fat with knowledge. Their notebooks are rumpled from learning." Home they go, just as the big rains begin. Can you guess what the rains do? When summer is over they will return to school, the little ones being the big ones now. And, once again, they will build their school so that they may all learn. 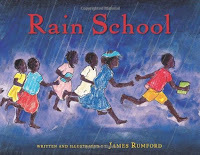 The illustrations are colorful, uplifting, and filled with James Rumford's love for Chad and its people. He lived there as a teacher and a Peace Corps volunteer. He clearly shows us, through his well chosen words and vibrant artwork, the importance of schooling in a country where few children have the opportunity to attend. I think that older sisters need to remember those little moments when the little sister is endearing. I don't think that time comes around too often. Of course, I have no experience to base these feelings on at all; I have a younger brother. But, my neighborhood friends had three girls in the family and I could not believe the chaos they managed to stir up on a daily basis. They took each other's clothes, screamed at each other constantly, spied on the oldest's romances, teased the youngest unmercifully. Today, they are best friends. 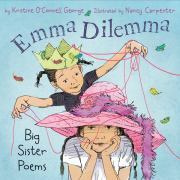 Jessica and Emma are sisters, and Jessica's observations of that relationship are so strong and clear in the perceptive poetry of Kristine O'Connell George. Emma can, at once, be funny and sweet while also being a bother and a brat. How does that happen? Jessica tries to be a good big sister. Can Emma not do the same? She is a dilemma! every single thing I do." Kristine O'Connell George never disappoints. She is perceptive and contemplative, and creates two characters who will resonate with anyone who has a sibling, but especially those who have a bright and charming, irascible and irritating little sister. No matter what Emma does to annoy Jessica...sneaking into her bedroom, telling wearying jokes or doing homework alongside her...there is love. It is evident in the storytelling, the pie-sharing, the gift buying and the concern when Emma hurts herself. The feelings run the gamut from one end of the scale to the other when Jessica is dealing with Emma Dilemma. that Emma hasn't ruined. " If you have a sibling, you have probably been there, and done that! If you want to evoke some of those old memories, get this book and share it with your kids. Then, you will have childhood stories to tell them.